You’ve seen it in Amelie, and again in Travelocity. What started out as a prank, is now somewhat a norm for travelers, though not always with a gnome. Anton listed a some bloggers who have their ‘gnomes’: Joey and her BJDs, Ariel with his Bearbricks, Isabelle and her tabo (water dipper), Batjay and his Spiderman, Via and her Merlin, and Miss McDonald. (no further introduction needed. Haha.) Of course, there’s also Anton and his 2-year old son, Aidan. 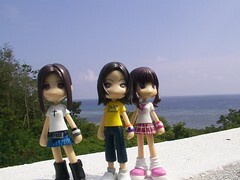 As for me, and Khursten, our gnomes are these 4-inch dolls that are just beyond cute: Pinky Street dolls. 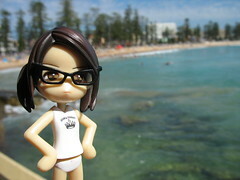 We’ve also lazed around and enjoyed the fine white sand beaches of the Gold Coast. 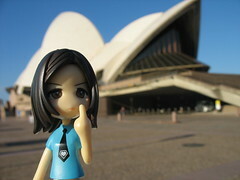 I know of a lot of people who like having their pictures taken with popular tourist landmarks in the background. I, on the otherhand, am uncomfortable if I’m standing by myself on the otherside of the camera. Odd, since I get more weird looks taking pictures of 4-inch dolls. 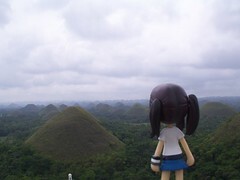 Weird looks or not, I really enjoy taking my dolls with me when I travel. They’re like instant company, a friendly face in a foreign land. Sans the conversations and arguments as to where to go and what to do, of course. 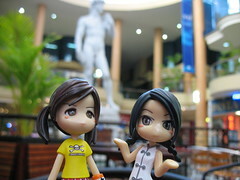 RELATED: Let's Explore Chiang Mai together! What about you, do you have a travel gnome? Pinkies make the best travel companions ever! Yep, I travel with my BJDs and shock airport personnel at the X-Ray scanner. I’m so amused by that Pinky (first photo, third row) doing that hand gesture. So cute! 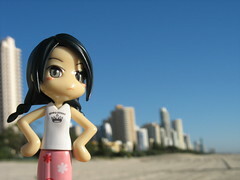 i’ve also taken my spiderman to see sydney, perth, brisbane, townsville and the GBB. 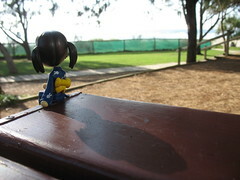 your doll and my doll have walked sydney harbour. how cool is that. the pinky street dolls are so cute!! do you know where i could get myself one? Hi Ayeen! 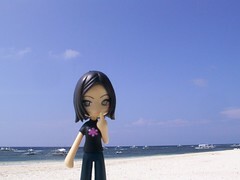 In Manila, Pinky Street dolls are available at Special Toys Center (branches in Virramall, SM North EDSA, Alimall and Festival Mall), Hobbitoi (Alabang Town Center), Rustan’s (not sure if they still stock Pinkies though) and occasionally, Great Toys (Shoppesville). If you’re not wary about ordering overseas, Hobby Link Japan is the best place to get them from.